In Mac OS X, iOS and in many apple products store serialized objects in property list files (.plist). These file are used to store information of applications, bundles, User settings. These files are of two types namely binary property lists and XML property lists. XML plist files can be directly viewed from any program which process XML files while binary plist files should be converted to plain text for investigation. We will be investigating the files under the following locations. 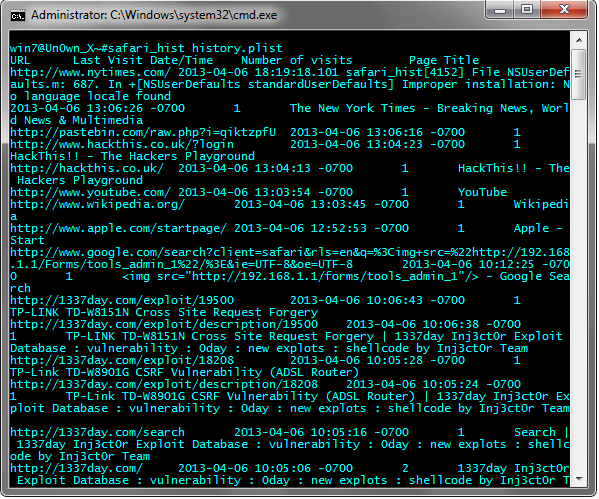 This file stores the visited URLs along with last visited date and time, number of visits, page title. Here is an example of my Computer. This file contains the entries of downloaded files and does not contain any cache files including images or any media. We can view this file using the SFT tool safari_downloads in this manner. This is a example from my Computer. 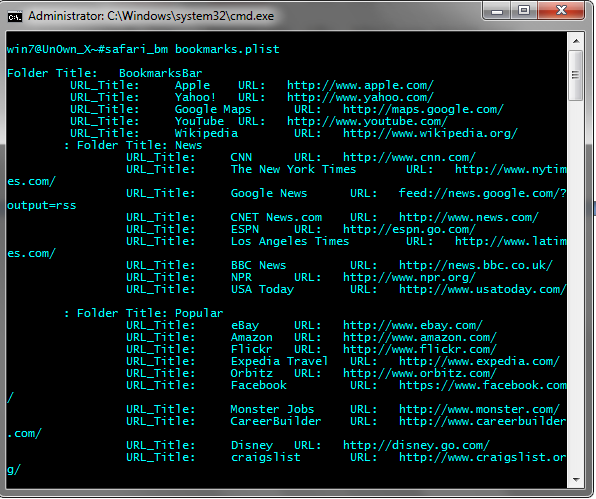 This file contains all the saved bookmarked URLs. This file can be processed by the SFT tool sft_bm. This file contains all the information related to cookies. This file can be parsed by safari_cookie_bin. 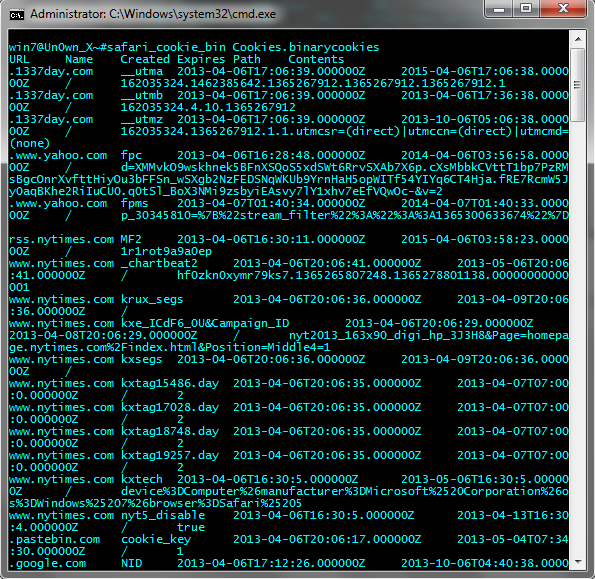 This file is located inside the cookie folder in the same location. This includes the URL, the creation and expiration time, the cookie content. 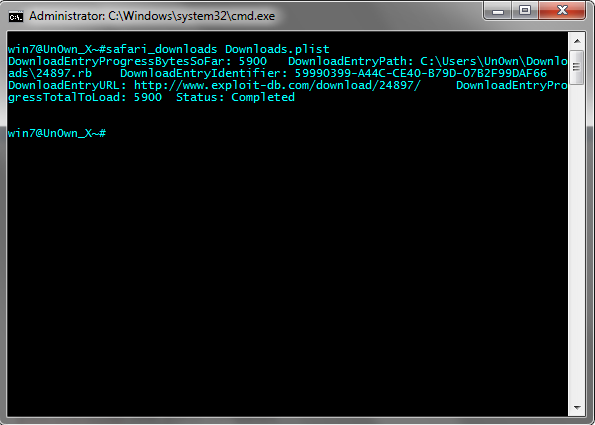 The cache files can be easily dumped by the SFT tool safari_wicache. This cache.db file is included the following location. And further more you can use sqlite GUI to view these cache files by using this query. SELECT * FROM cfurl_cache_receiver_data; Further more if you want to learn about the safari cache.db investigating see the reference. All property list file can be also processed by a tool called plutil.pl by Pete M. Wilson which is a open source perl script that can convert binary plist files to a XML readable form. This is the last tutorial and from this I conclude the Browser forensic Tutorial Series. Thank you for reading these and I am happy if you learned something new.